Arthur Slade was raised in the Cypress Hills of southwest Saskatchewan (on a ranch) and began writing at an early age. He received an English Honours degree from the University of Saskatchewan, spent several years writing advertising and now writes fiction full time. He currently lives in Saskatoon, Saskatchewan, Canada. 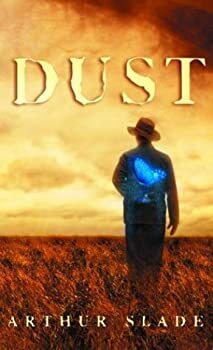 If Ray Bradbury’s Something Wicked This Way Comes met Philip Pullman’s The Golden Compass in the world of John Steinbeck’s The Grapes of Wrath, you might end up with something like Arthur Slade’s YA novel Dust. Or at least, you might end up with the basic premise, setting, and tone and style. Falling short of these classics is no great fault, but unfortunately I’d say Dust falls a bit short even in less rarefied company. It isn’t a bad book by any stretch — it is in fact quite solid and has some lovely moments — but overall it fell a bit flat for me. Northern Frights — (1998-2000) Ages 9-12. Publisher: While visiting their grandfather in Manitoba, Canada, three American children experience an event based on Icelandic mythology in which a man comes back from the dead to seek revenge. Arthur Slade’s Canadian Chills —(2002-2007) Ages 9-12 Publisher: When Daphne’s sixth-grade teacher, Miss Vindez, plummets from the belfry of St. Wolcott School, Daphne and her friends Nick and Peach are plunged into a mystery that includes a long-ago fire that left behind 12 dead schoolchildren, tiny ghosts with nowhere to go, and an ancient evil just dying to break through into modern-day Moose Jaw.Miss Vindez survives her fall, but things just aren’t the same — she’s spouting gibberish, and both Principal Peterka and the school janitor are definitely not themselves at all anymore. Determined to get to the bottom of what’s going on, Daphne, Nick and Peach dig up the troubled history of Grudstone, the school that used to stand where St. Wolcott is now. They uncover evidence of a crime so terrible it can hardly be believed. Worse, the terrifying perpetrator of that crime isn’t done yet — he has more horrible plans in mind. And all that stands in his way are three Moose Jaw school kids. Using his acclaimed skills at creating chilling tales for young people, Arthur Slade has produced a truly riveting story destined to keep bedroom lights on for many nights to come. The Hunchback Assignments — (2009-2012) Young adult. Publisher: A gripping new series combines Steampunk, spying, and a fantastic Victorian London. The mysterious Mr. Socrates rescues Modo, a child in a traveling freak show. Modo is a hunchback with an amazing ability to transform his appearance, and Mr. Socrates raises him in isolation as an agent for the Permanent Association, a spy agency behind Brittania’s efforts to rule the empire. At 14, Modo is left on the streets of London to fend for himself. When he encounters Octavia Milkweed, another Association agent, the two uncover a plot by the Clockword Guild behind the murders of important men. Furthermore, a mad scientist is turning orphan children into automatons to further the goals of the Guild. Modo and Octavia journey deep into the tunnels under London and discover a terrifying plot against the British government. It’s up to them to save their country. Monsterology: Fabulous Lives of the Creepy, the Revolting, and the Undead — (2005) Ages 9-12. Publisher: Monsterology: Fabulous Lives of the Creepy, the Revolting, and the Undead is the most fun anyone can have with some of the nastiest creatures ever imagined! Who can resist morsels like the fact that “Drakul” means “son of the dragon” in Romanian, that the first Golem may have been Enkidu, who appeared in the ancient Epic of Gilgamesh, and that Frankenstein’s Monster was first inspired by Mary Shelley’s nightmare? Governor General’s Award-winner Arthur Slade has gathered together fifteen scary critters, ranging from Dracula to Golem, from Frankenstein to Baba Yaga and even a zombie. He provides facts, real history, imagined history, and lots of jokes to make these creatures come to life. Slade’s hilarious text presents delicious imagined gossip, favorite blood types, favorite movies, and even favorite haunts (you should pardon the expression) with character descriptions and thoroughly researched background information. Lively black-and-white illustrations by Derek Mah make this a book that is sure to be a hit with every monster-loving reader. Villainology: Fabulous Lives of the Big, the Bad, and the Wicked — (2007) Publisher: Villainology is a veritable who’s who of characters from the underworld. Be they fictitious or all-too-genuine baddies, they are bound together by their infamous deeds. Author Arthur Slade takes a lighthearted view, nonetheless, and provides personal stats, their likes and dislikes, their high-school memories and an amazing array of cool facts along with up close and personal “interviews.” Readers will not only come away amused, they will come away with an enlarged store of general knowledge. Among the fourteen notable villains included are: The Wicked Witch of the West, Attila the Hun, The Wolf, Billy the Kid, The Headless Horseman, Morgan le Fay, Quin Hui, The Invisible Man, Scarface Capone, and a lineup of Shakespeare’s most memorable villains. Never-before-seen portraits of each by artist Derek Mah, make for a deliciously delectable rogue’s gallery. Jolted: Newton Starker’s Rules for Survival — (2008) Young adult. Publisher: Newton Goddard Starker lives with a mysterious curse: his family attracts lightning. Nearly all of the Starker family have died from lightning strikes, including Newton’s beloved mother. Fourteen-year-old Newton, the last in the Starker line, is determined not to be next, and he may have found a way to beat the odds. He has enrolled at Jerry Potts Academy for Survival, a boarding school in Moose Jaw, Canada, whose motto is Survival Through Fierce Intelligence. Newton’s ready to learn, and to be remembered in the school’s Hall of Heroes. What Newton hasn’t counted on is the other students. For a boy who’s spent most of his life in a protective dome, making friends is sometimes as challenging as surviving. Especially when he’s vying for top marks with the dynamo Violet Quon. Throw in a supertalented pig, students in kilts, wacky teachers, and some important questions about fate and the universe, and you’ve got an irresistible story that’s as unique as Jerry Potts Academy. Stubb – a boy named Stubb will prove he’s a werewolf one way or another. Virtual Dragon – in the future Kung Fu movies will rule the box office and wars will be fought over the proceeds. Jesus Busts A Bronc – a special appearance by Jesus at a small town rodeo. A miracle? And what is Judas doing there? Bubbles: The Diary of Terrance Winslow – some neighbors are much, much worse than others. Snow White and the Seven Elves – how to win the kingdom and look good while doing it. Garbage Day – One never knows what’s really in the garbage. Sixteen startling stories in all. CLICK HERE FOR MORE BY ARTHUR SLADE.